The sixth of Icelandic author Arnaldur Indridason’s novels featuring the lugubrious Erlendur, ‘Hypothermia’ is something of a departure from the format of those that preceded it. 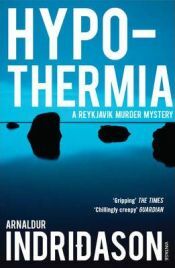 Here Erlendur more or less goes it alone as he carries out his own off the record investigation into the case of the apparent suicide of a woman at her holiday home in Iceland’s Lake District; Erlendur is not directly connected with the case but becomes involved when it is found that the dead woman lived on his patch. Everything seems straightforward until a couple of days later when a friend of the dead woman asks to see him; she tells him that there is something that doesn’t seem quite right with the events around Maria’s death and that, although Maria had been depressed for several years since the death of her mother, with whom she and her husband, Baldvin, lived, she doesn’t believe that she would have killed herself. Her main argument is that Maria had recently visited several mediums and, particularly after the second visit, had seemed to have picked up a great deal. Karen also gives Erlendur a cassette of a recording of a meeting between Maria and one of the mediums she had visited. There’s no reason to suggest that Maria’s death was anything other than suicide but once Erlendur’s interest has been pricked, some anomalies start to appear in the accounts of those closest to Maria and Erlendur quietly sets about his own investigation. Meanwhile the elderly father of a young man whose mysterious disappearance Erlendur had looked into some decades previously, pays his annual visit to the police station in the vain hope that this might be the year he finally learns what happened to his son. After his visit Erlendur digs out the records from that investigation and another, the similarly baffling disappearance of a female student who went missing around the same time. Perhaps because the old man has little time left to live, Erlendur sets about re-evaluating the evidence and before long his enquiries direct him again towards Iceland’s lakes. Regular readers of Indridason’s Reykjavik mysteries should find this departure a treat; we see a significant step in the development of the character of Erlendur and, for fans of the introspective Inspector, an opportunity to spend some quality time with the man. While “Hypothermia” can be read as a stand alone, it’s the only novel so far in the series (excepting the first of course) that is better read after at least one of the others. His usual sidekicks Sigurdur Oli and Elinborg feature only fleetingly but the references to them may be lost on newcomers. Indeed, the nature of his private investigation offers an opportunity to really develop Erlendur’s back story, which is the tragic death of his younger brother many years previously. As the character of Erlendur develops so too does the family portrait; in this novel his daughter, Eva Lind tries to persuade Erlendur to meet up with Halldora, his ex-wife and mother of his two children. Having resisted his daughter’s attempts to stage a reconciliation between her parents on several occasions previously, Erlendur surprises his nagging daughter by finally agreeing to a meeting. I found this an interesting prospect even if, ultimately, it was a futile digression and not utilised to advance the story as it could have been. Still, this is another excellent piece of writing and one that should please fans of Erlendur; technically it’s a great piece of crime fiction which continues to highlight just how brilliant Indridason is at evoking the cold, bleak landscapes of his native Iceland. If you haven’t read any of the “Reykjavik murder mysteries” it may not be the best place to start but I urge to catch up as soon as possible!